Tools and languages. Initially the tools and languages might be different but things seem manageable. In particular, developers look to put as much code in common languages (“platform agnostic code”) or implement code as a web service (independent of the client device). This is a great strategy but does not allow for the reality that a good deal of code (and differentiation) will serve as platform-specific user experience or integration functionality. Early on tools are relatively immature and maybe even rudimentary which makes it easier to build infrastructure around managing a cross-platform project. Over time the tools themselves will become more sophisticated and diverge in capabilities. New IDEs or tools will be required for the platforms in order to be competitive and developers will gravitate to one toolset, resulting in developers themselves less able to context switch between platforms. At the very least, managing two diverging code bases using different tools becomes highly challenging–even if right now some devs think they have a handle on the situation. Some will undoubtedly call for standards or some homogonization of platforms. Posix in the OS world, Motif in the GUI world, or even HTML for browsers have all been attempts at this. It is a reasonable goal given we all want our software investments to be on as many devices as possible (and this desire is nothing new). But is it reasonable to expect vendors to pour billions into R&D to support an intentional strategy of commoditization or support for a committee design? Vendors believe we’re just getting started in delivering innovation and so slowing things down this way seems counter-intuitive at best. Really enjoyed this post, is there any way I can get an email sent to me when you publish a new post? I don’t even know the way I finished up right here, but I thought this submit was once good. I do not realize who you’re however certainly you’re going to a well-known blogger when you are not already. Cheers! There is a difference between today platform war and previous years platform war: user base size. When windows won the user base was in millions, this year iOS will pass one billion users target and Android passed the target last year. App developer do want to reach as many users as possible, but a user base of one billion is enough to allow an app to thrive, the effort required to have a two billion users target can be made once the app has lift off, there is no need to target two or more platforms from the start. If you concentrate to get the most from your first platform and have success than porting will follow. Usually the platform with the most spending users is chosen, iOS, but really the size of the installed user base is not a issue, both iOS and Android have won and have enough users to remain effective in the future. sites to read posts, but this blog presents quality based articles. BB:I must say I enjoy re-reading your article. As to my fandig memory bank …. well I still couldn’t tell you a thing as to what I was going to say a-year-and-a-half ago.Anyway, here are my belated comments :PAt the beginning of your article, I think what you were defining “governance” – how a tribe / community / society /country organizes its functions and manages its members.However, towards the end of the article, you were talking about something else.In my humble opinion, governance 治理 is not the same as government政府, which is related to but not the same as politics 政治. Very nice perspective on developing apps for multiple platforms. Whether Windows 8 was/is great is irrelevant. The consumer has not embraced the product and the stock market has now voted. A $32 billion decrease in value cannot be ignored. From a manufacturing and feature standpoint, the Edsel was a great car. But as we all know it was not embraced by those spending the money. MS will need to change it’s vision to match end user taste or the future will not be a bright one. Windows 8 may be a developers dream, but your market does not seem to like it. Great Blog, but doesnt MEAP are trying to address this cross platform issues to an extent? option? There are so many choices out there that I’m totally overwhelmed .. Any ideas? Thank you! I shipped my first (intended for tablets) app on Windows Store last month by way of learning. Learning because I’m pretty certain my understanding is closer to DOS1.0 than WindowsMillenium end of the scale. For grasping native experience to be felt by users, I consumed applabs. I’m bootstrapping tablet app development business so let me particularly thank you for enumerating your as an experienced products developer insights in this post which I find most valuable. I’ve to raise some points that I wish you to touch in the next post on apps marketplace. 1. You’ve enlisted some mobile handset OSs namely Windows Phone, iOS as modern sealed-case platforms. Is Windows RT so different from Chrome, MacOS, or any other PC OS? 2. You’ve mentioned cloud computing, that as per my comprehension is modern morph of primitive time sharing commercialized by IBM Series 360 mainframe during 60’s, now making use of advances in hardware virtualization with the very same goal: scalable resource provisioning. The most lovable part is the data center carbon footprints. Online search (or more correctly) advertising giant with support from government intermediary agents particularly love the network is the stalker (was it Java CEO who said that?) cloudy aspects. Users were in control of clipboard content with drag-drop copy-paste, so if notepad will not understand Powerpoint, unlike cloud-sync amongst devices, user is well trained with specific device. This is analogous with post-man will use any (cross-platform) pen, but CEOs signing bank demand drafts might use specific (native) pen with great comfort. I raised this point with regards to wanting development build-chain of framework library toolkits and end result apps to be native vs. cross-platform. Phones being ubiquitous may need to be cross-platform, but if tablet will run Windows Phone/Android instead of native experience oriented Chrome_RT/MacOS_RT, then to which extent will it be PC-capability-disabled idiot box+oversized phone+overpriced low-end gaming console? 4. ISV/language/integrator: To begin with observe ISO C++ has templates (that supports) meta-programming and templates come with their own standard library, so generic programming paradigm librarian (shortened library developer) sees vector (container), while the coder/developer/architect sees bank accounts clubbed together. The trouble here is more with syncing the (diploma) coder, (bachelor’s graduate) developer, and (masters post-graduate) architect who tend to advance out-of-step with each other while improvising the next iteration of products. For simpler apps this is as simple as pick the latest framework version available from you. For sophisticated (costly) ones, its heavy-lifting to deliver updates without breaking early implementations (IE6 was supported around when IE9 was paraded as current version). And that’s difficult, I’d hate to be in your shoes overlooking the huge responsibilities you did.. but then I’ve long way to go. My point here is invest in framework once to alleviate the tough situations that are clearly in-sight. ISO C++ was just my pick to highlight the path on map. 5. Challenges/cross-platform libraries/”shadow meta API”: Games are just tip of the ice-berg. When I aimed to make native modern UI app that might consume Portable Class Library from F#, I never imagined to bother with CX, but it was either that or wheel reinventions. Now that I’ve successfully complied with Store requirements (initial battle), the war (usability guidelines applicability) related with apps domain-specific (Productivity category of the store in my case) features has just begun. Over dependence on meta APIs might be poor choices, still very thin layer APIs (like C++/CX has thin wrappers, namely, Platform::Vector or Platform::String) have to be identified early on to save from unpleasant developments later. This is my job as an architect for my product line choice of productivity apps. I’ll answer one of your questions: What’s next? Will developers be able to pick a platform and reach their own business and product goals by focusing on one platform as a way of avoiding the issues associated with supporting multiple platforms? These difficulties will bifurcate the smart and honorable (sometimes flamboyant) soldiers from the punk (jerk) bullies at least. The other regarding billions spent, that’s some CEOs concerns who know when to discontinue successful products citing branding difficulty or go on buying spree. Finally, I’ve hardly opened my eyes in the development business world, so if my views exhibit lack of awareness of some hard-pressing issues or are not well-formed in some way, forgive me- laugh at my expense and cover anything of relevance in some other interaction elsewhere for us newcomers to follow..
Hi Steven, thank you for the thoughtful and insightful post. The challenges of cross platform are great, especially for my world in the mid-sized enterprises space. Companies with few developers, limited budget (under $10m per year) and limited time to make the biggest bang for the buck. I actually enjoy the challenges in this emerging platform landscape. And this fast pace will only continue, in my opinion. Wearable/portable devices are disposable…giving ecosystem providers many more opportunities to grab consumers than in the past. Many of us change devices (and ecosystems) every 2 years. For the most part, I encourage a bare minimum client that solves the business need…and back-end (cloud) all that is not device specific. Event client-side logic can be downloaded once and stored locally to save data minutes and keep the app agile. Being in the mid-sized business world, we keep our programming languages to a minimum. MVC .Net for web and XAML for native are our choice, thanks to cross platform tools that integrate directly into Visual Studio. In some limited cases, we code natively in a device-specific language…but those situations are rare. On a personal note, I cannot speak highly enough about you and your team’s Windows 8 “Metro” architecture and implementation. The horizontal ecosystem (apps sharing data & functionality with other apps via contracts) is unmatched in any platform. The security and power performance introduced by the “If you see the app, its running. 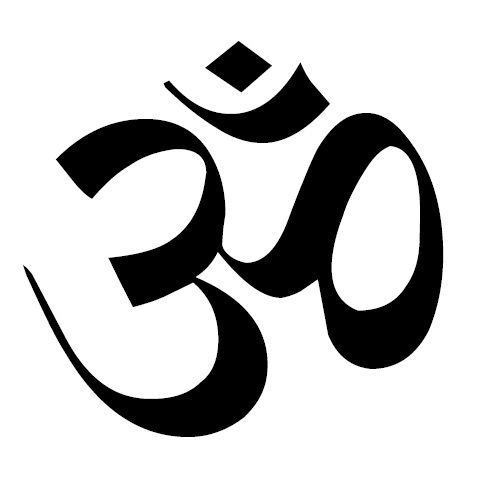 If you don’t see it, it is suspended” also has no equal. The app integration with Windows via Share, Search, etc. is a dream for developers. Not to mention all of the non-app revolutions. Thank you for your work and hope you are enjoying your new callings in life! Thank you for the kind words DavidI — I will be in touch. Excellent post. Got me thinking about how the platform concept might be evolving. Today you can broadly say that a ‘platform’ is the software layer bound to a particular hardware device or family of devices that enables it to support a variety of apps. The idea being to make it general purpose and of course to sell a gazillion units (or mine the analytics of their use!). But, I can envision a world where increasingly devices will proliferate and narrow in purpose. So rather than being a generic app host, they become narrow-purpose devices. When hardware is cheap (and wearable), this isn’t so far-fetched. I can imagine my phones, glasses, watches, TVs, game consoles, fitness sensors, go-pro cameras, tablets, car, and ski goggles all being app enabled (but largely used or suitable for only one or a few apps). Who knows, but maybe eventually the morphing of devices into specific use scenarios makes the cross-platform app development problem moot. Of course the new problem then is how do you train your ObjectiveC and Java devs to use soldering irons and 3d printers! Add me to your list of fans Steven. Have always loved the level of insight you provide and your willingness to share details. Steve – thank you so much for the great blog post. We are shipping support for Windows(32/64), Mac OSX and iOS with our Embarcadero Delphi XE4 product. We use our FM Component Framework to encapsulate all of the common capabilities of Desktop and Mobile platforms. We have refactored and updated the components over 3 generations (now) of product releases. Using native code optimizing compilers for each platform we can also give developers access to the operating system APIs and to the hardware. We have also built multi-platform Device, Sensor and Platform Services into the component framework to provide single source code project access across the platforms. Next up is Android support using the same component framework. I agree that in shipping products we learn each time how to provide a visual design IDE, rapid software prototyping workflow and the ability to build components and extend components in the FM Component Framework. Adding support for services via SOAP and REST helps connect to the interfaces of server and cloud functionality. We also ship all of the source code to the FM Component Framework and RTL for all platforms we support, so that developers can see how we do it and also can learn how to build in additional components. We also have Windows (32/64) and Mac OSX support in our C++Builder product. We definitely learn by shipping. The great thing about developers is they will tell you 24×7 what they like and don’t like. Using component based development allows us to keep the same interfaces while continuously implementing and improving the underpinnings. On a personal note, I still have a copy of the video I shot of you, Bill Gates, Richard Hale Shaw, Paul Gross and a Waggoner PR member in our Borland booth at Comdex when you were Bill’s technology advisor. I was video taping Bill watching a Borland C++ presentation in the booth. After a few minutes Bill said something to you and then you came over to me and asked me to stop taping. Of course I did. Maybe you remember that day in our Comdex booth? I have always been a Steve Sinofsky fan! Keep up the great work now in your educational and industry perspectives roles. Primarily I feel that the debate for supporting multiple platform falls on the costs for developing and maintaining the applications across all platforms. Additionally the reach each platform has, plays a important role in determining if the investment is wise or not. More importantly, My belief is there is no winner or losers in this. Its who delivers a compelling developer experience that allows platforms to accomplish more, and design improved products/apps for their customers. As you said, its a cycle and it all boils down to how a given platform provider leap frogs to give a more complete/feature rich development experience from its predecessor. For each player (app platform provider) who intends to enter this playing field to make an impact, gather the market attention and share, shouldn’t the goal be to create an engineering ecosystem that is easy to develop for and provide compelling features so that the developer community takes a active interest in developing apps. Now obviously the million dollar question. What should the engineering strategy be to provide a compelling developer experience. Times are changing and virtual services are becoming more prominent. What would be your take on reworking a platform to take advantage of the horsepower the virtual processing power offers to develop more feature rich platforms. Would be nice to hear (follow up blog may be!) your take on what should be the engineering strategy to build a developer experience that developers naturally take to writing apps on or code. Just curious, When at Harvard and working with the student -startups what was your advice to competing with more established competitors. Steven. Great description on the competing voices for what directs native vs. cross platform development. I still have the siren song from Sun ringing in my ears from 1994 “Java = write once, run everywhere”. Having spent 12 years at a major platform provider (in Cupertino), I understand the business pressure developers have to be one as many screens with abbreviated effort. While in the short run, that goal may be achieved, long term, the developer is painted into a corner (API changes, etc) Whether its Windows Mobile, Android or iOS, build native . . . always. Hmm…that doesn’t sound like Windows has much of a shot in mobile then. 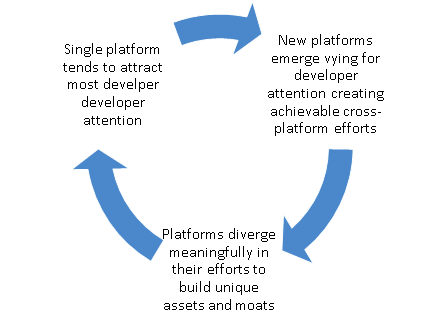 Thank you Mr. Sinofsky for this excellent analysis of the subject of cross platform development. Most interesting, even from a non programmer perspective. Very nice article. I am fan of yours. Hope to work with you someday.